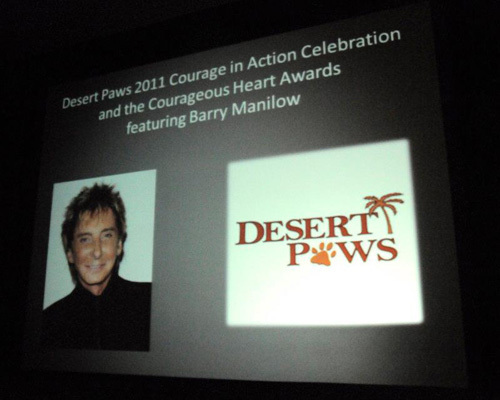 The first Courageous Heart Awards were presented in October 2011, in Rancho Mirage California, at AIA’s Courage in Action Celebration. The awards publicly recognized and paid tribute to individuals in the Coachella Valley community who took action and worked effectively on behalf of animals. Volunteer or employee in an organization. Community animal hero (a person who works independently in any animal welfare related activity). Educator (a professional who teaches respect towards and compassion for animals). Veterinarian or animal medical care employee. Animal control / law enforcement. Universal animal activist (an individual deeply committed to improving the welfare of all animals). Youth animal advocate (for individuals younger than 21 years). Winners received a handsome, custom inscribed, acrylic, heart-shaped trophy, presented by Advisory Board Member, Barry Manilow, and AIA’s President, Dr. Lori Kirshner. Winners also received a Certificate of Special Congressional Recognition from U.S. Congresswoman Mary Bono Mack.